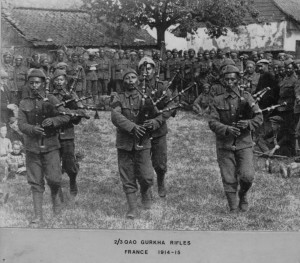 During the First World War (1914–18), more than 90,000 Gurkhas served in the Indian Army, suffering approximately 20,000 casualties, and receiving almost 2,000 gallantry awards. Gurkhas fought on the Western Front, Gallipoli, Egypt, Palestine, Mesopotamia and on the North West Frontier. 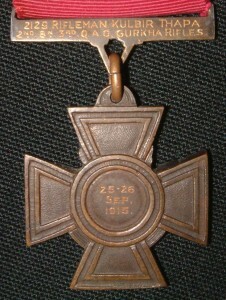 During the Battle of Loos in France in the autumn of 1915, a battalion of the 8th Gurkhas suffered terrible casualties, hurling themselves time after time against the weight of the German defences, and in the words of the Indian Corps commander, Lieutenant-General Sir James Willcocks, “… found its Valhalla”. At Gallipoli, the 1st/6th Gurkhas, having landed at Cape Helles, led the assault during the first major operation to take out a Turkish high point, and in doing so captured a feature that later became known as “Gurkha Bluff”. At Sari Bair they were the only troops in the whole campaign to reach and take the crest line and look down on the Turkish defences. The first Victoria Cross awarded to a Gurkha was that won by Rifleman Kulbir Thapa for valour at the Battle of Loos in September1915. Three VCs were awarded to Gurkha Regiments during the First World War.